Burundian President Pierre Nkurunziza’s attempt to run for a third term brought thousands of protestors out into the streets in opposition to this move. Recent events in Burundi have brought the small nation to international attention, even if action remains wanting. The announcement on 23 April by President Nkurunziza that he would run for a third term has sparked fierce opposition. 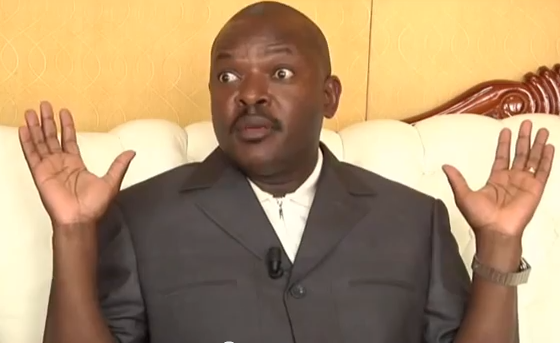 Although Burundi’s constitution contains a two term limit, Nkurunziza argues, and the Constitutional Court agreed (albeit reportedly under pressure) that his first term does not count because he was appointed by parliament rather than in a general election. Serious protests have rocked the capital Bujumbura, where there are increasing reports of violence between government forces and protesters. Such reports would be worrying in any country. But they are particularly concerning in Burundi, a country with a long history of mass violence that has been negotiating a protracted and painful transition to peace since the signing of the Arusha Peace and Reconciliation Agreement in August 2000. With opponents claiming that Nkurunziza is undermining the Arusha Agreement, the next few weeks are likely to be decisive in determining whether the country will remain on the trajectory towards peace or return to conflict. Mr. Nkurunziza’s bid for a third term is clearly the trigger, but tensions have been simmering for some time, as the ruling regime has been accused of becoming increasingly dictatorial. The outcome of his actions may appear to be as predictable as his desire to retain power, which begs the question: why, as the custodian of your country, would you choose this course of action despite the risk of plunging your country back into civil war? There is a high price to pay, however, for his resistance. He believes he could be assassinated at any moment. A number of those who signed the petition were immediately removed from the party, losing their jobs and income. His ability to move around is highly restricted, and he is unable to visit his home. He lives with the constant fear that not only will he be attacked, but that his family and friends are also in danger. “Fighting for democracy” has an ominous ring to it, especially in Burundi. Like many, he is hoping that the president withdraws his candidature, but he sees this as unlikely. Allegedly, the president has surrounded himself with supporters, including an armed youth wing – the notorious imbonerakure (meaning “those who can see from far”) – that is unlikely to want to relinquish power without a fight. Echoing the fears of so many, the interviewee argues that the coherence of the armed forces will disintegrate and large-scale violence will follow. If this happens, all the achievements of the past ten years could disappear, which would be a tragedy not only for Burundi but for countries across the region. With a terrible sense of déjí vu, Rwanda, DRC and Tanzania are already receiving thousands of refugees. Despite the risks, civil war is not inevitable. Although leaders like Ugandan President Yoweri Museveni and Zimbabwe’s Robert Mugabe have been able to change their constitutions to retain power, across the continent, strategies to prevent the escalation of violence from deteriorating into civil war are cause for hope. Similar protests in Burkina Faso forced President Compaore to resign and, despite fears of civil conflict, Nigeria’s Goodluck Jonathan accepted defeat in Nigeria’s recent election. However, it remains to be seen which path Burundi will take, and whether or not the international community will effectively support Burundians working for peace. As Burundians know only too well, legacies of violence can never be under-estimated. Lucy Hovil is Senior Researcher, International Refugee Rights Initiative. Water under the Desert: Blessing or Curse? The citizens of Burundi are now embarking in on a civic social election process culminating int the election of a president. Citizen Candidates seeking public office in the ideal normative sense of prescriptive governance ought only to be seeking public office in order to serve all the good citizens of Burundi which ought to exclude serving and assisting only the â€˜status quoâ€™ elite economic social political oligarchy who only will continue to perpetuate the present â€˜status quoâ€™ ensuring that civic social change for the ordinary citizen is marginal at best. Burundi is a country blessed in natural pristine tropical forested beauty which has created and generated much wealth resources. Burundi is even more blessed with the Burundian citizen people, who often display exuberant entrepreneurial ambition. Alas, this presidential election is now roiled both in fear as to uncertain security publics grounded in that the incumbent President wishes not to respect the constitution in seeking a third term of office. Burundi is as well suffering in the concentration in personal private wealth benifiting only the elite oligarchy. Civic social anxiety in Burundi is increasing and respect for rule of law and prescriptive strong robust institutions is unravelling. Sadly, this 2015 Burundi Election for President gives ample profound credence to this pithy aphorism by H.L. Mencken who writing in the Baltimore Sun in 1936 suggests most strong that “An election is nothing more than the advanced auction of stolen goods Â»â€”â€“Â« in other words, government is a broker in pillage, and every election is a sort of advance auction sale of stolen goods”. Mencken was both alarmed and profoundly disquieted as to the lack of engaged inquisitive civic citizen participation in the civic electoral governance process which is predicated on an engaged articulate citizen who is not afraid nor adverse to hold the government to strict account. Mencken was even more concerned as to the increasing growth in blunt force power of the incumbent government to overwhelm the citizen with election promises and election bromides which in reality will signal no change in how government functions in serving the citizen. This is not merely an indigenous Burundian civic electoral issue of absolute concern. Rather, this presidential election in Burundi is a civic electoral matter of manifest urgency to all nation states who are engaged in governance conversations between the governed and those who govern.